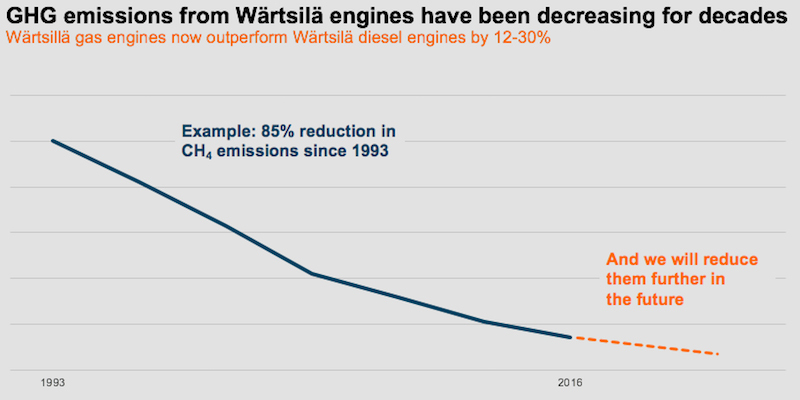 As part of its efforts to minimize the environmental impact of its products, Finnish technology group Wärtsilä said it has set a target to cut Greenhouse Gas (GHG) emissions from its gas engines by a massive 15% between 2015 and 2020. If you want a pure win-win solution in terms of emission reduction, the first thing to do is choose gas. Not only does a gas engine emit between 13 and 30% fewer GHG emissions than a diesel engine, it also delivers huge reductions in local emissions. Gas emits 90% less NO2, 99% less SO2, and 90% fewerparticulates. What’s not to like? In 2015, the company had set itself an ambitious objective to cut the total greenhouse gas emissions across its entire fleet of gas engines by an average of 15%. At the end of 2017, 7% had been delivered. Moving further, Wärtsilä is not only working to reduce its CO2 emissions, but also the so-called methane slip, which is the name given to the methane fuel that goes into the engine and comes right out without having been combusted. Methane is an extremely harmful GHG, as it is 28 times more potent than CO2. Knowing the harm that methane can cause, as well as the obvious economic losses associated with pumping in fuel that is not used, Wärtsilä has been working on reducing the methane slip for more than two decades. Since 1993, we’ve secured an 85% reduction in methane emissions, and we’re not finished yet. During 2017, the company identified and determined the technology packages that it will implement on both existing ranges and future products to secure further GHG emission reductions and achieve its 2020 objective. Examples include new developments in battery-engine hybrid technology as well as the potential advantages of connectivity and digitalisation. The number of engine adjustments per second made possible by digital technology are huge compared with what we could previously do either manually or mechanically. As a result, the digitally controlled engines of the future will be significantly more optimised than their predecessors. Additionally, Wärtsilä said it has invested heavily in creating an offer to enable the effective utilisation of LNG, to help ship owners and power companies reduce their environmental footprint.